Performance Ink is located in Columbia, South Carolina, and was founded in 2000 by John Register. John has been in the industry for 20+ years. He spent 10 years as General Manager of a manufacturer of industrial screen printed products including membrane switches. His responsibilities included all operational decisions and strategies for growth of the company. John brings his operational experience and innovative techniques to guide Performance Ink in successfully serving its business and industrial customers for many years to come. 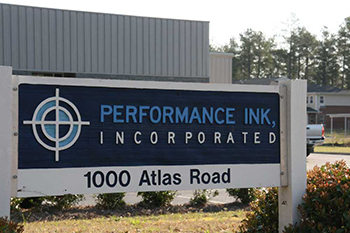 Performance Ink constructed a new state-of-the-art facility in 2002 with a recent addition in 2010 to handle its current customer demands and better respond to planned growth. Our staff has over 40 years combined experience in the industry and prides itself on producing custom screen-printed labels and decals, membrane switches, graphical overlays and domed products. The Company also provides unique nameplate solutions through its Patent Pending process called VersiPlate™. Performance Ink also has a complete in-house art department with capable designers that will work with you to design the image that best presents your product or company’s function and identity. We provide design and engineering services, and can also utilize the capabilities of our in-house digital printer and plotter to produce labels of comparable quality and durability to screen printing. Our customers include major manufacturers of controls and instrumentation, heavy equipment, industrial machinery, vending machines, large-ticket consumer products, gas pumps and high-tech equipment. Our products are also used to identify and brand many businesses, organizations and institutions where quality of image and durability is important. Our staff is ready to serve you with our unmatched technical skills and “attention to detail”. We work closely with our customers to insure order quality and on time delivery, to meet our customers’ rigid demand schedules. We hope you will consider Performance Ink for your printing needs. Please contact our helpful staff with any of your current and future requirements. We value the opportunity to serve you as a customer of Performance Ink.